Of course, by "anything", it still needs to satisfy the usual hardware and software requirements, but these requirements are reasonably modest, considering what SQL Server is capable of. According to Microsoft, SQL Server is the number 1 most-used database in the world. According to various other sources, it's more like number 2, 3, or 4. In any case, it's one of the most popular database management systems in the world. Since the release of SQL Server 1.0 in 1989, SQL Server has evolved to become a true, enterprise information platform. While it's core function is that of an RDBMS, SQL Server has become much more than that. SQL Server 2016 includes built-in business intelligence tools, as well as a range of analysis and reporting tools. This is on top of the database management tools such as database creation, backup, replication, security, and more. This tutorial focuses more on the database management tools. These are some of many tasks that a database administrator (DBA) might need to perform. 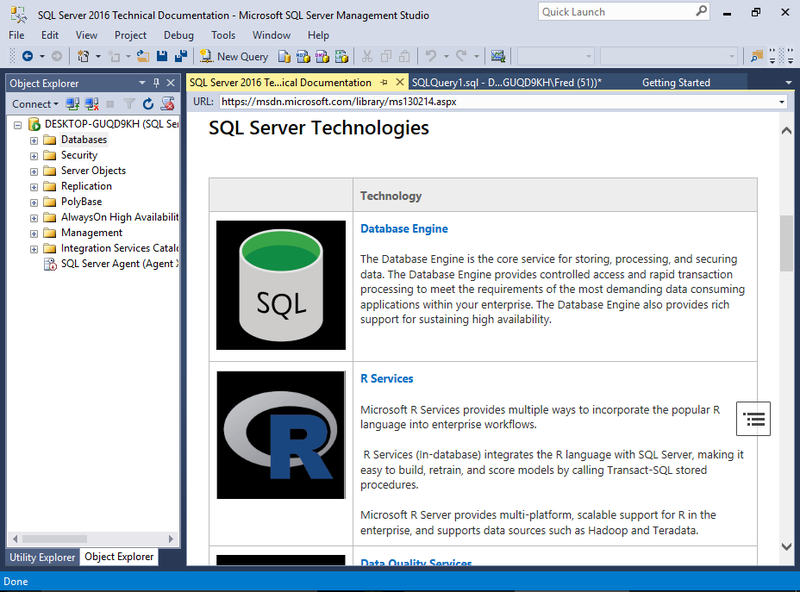 SQL Server provides the means for performing these tasks. SQL Server is a client/server DBMS, as opposed to a desktop system such as Access. Client/server systems are designed to run on a central server - or servers - so that multiple users can access the same data simultaneously from across a network. Users normally access the database through an application. For example, a web-based corporate CRM could be used by employees in various cities, or even countries, all reading and updating data via their browser. Other client/server databases include MySQL, Oracle, and PostgreSQL, to name a few.